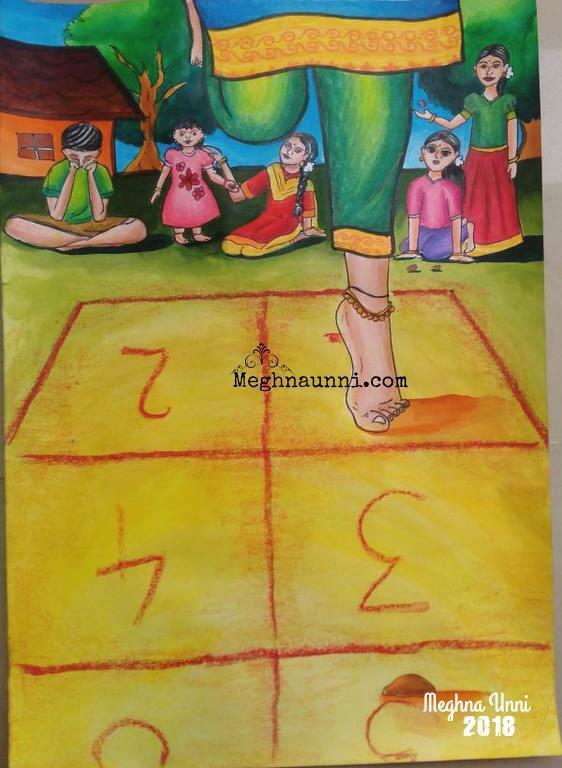 Kith-Kith is an Indian traditional game similar to Hopscotch, played by most children in our country. It is known by various names in different states of India like Stapu, Ekhat-Dukhat, Paandi (Tamilnadu), Chirpi (Maharashtra), Kunte Bille (Karnataka), Tokkudu Billa in Andhra Pradesh and Telengana, Ekka Dukka in Bengal and Khane in Kashmir. The players must hop on one foot and must throw the marker in the right square. The player jumps into the square, lands on one foot and kicks the marker to the consecutive square with another foot without touching any lines or the marker falling on the wrong square. Mostly girls play this game though boys too join them at times. So here is a painting I made for the children game Kith-Kith.